May 3: The Star has the story Anifah: "My Sabah" group formed to discuss Sabah's state rights but nothing like reading, verbatim, what Foreign Minister Anifah Aman has written on why the group was formed and how he can sit and is sitting with the likes of Jeffrey Kitingan and Yong Teck Lee and the Opposition that matters in Sabah (and vice versa) for the larger interest of the state and the nation. Seeing his train of thoughts, it is easy understand why Selangor Menteri Besar Azmin Ali, the man calling the shots in PKR, was wishing Anifah would quit BN and join him. 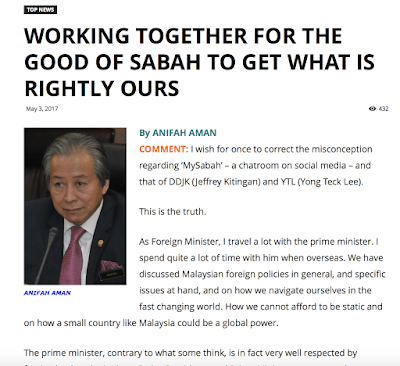 COMMENT: I wish for once to correct the misconception regarding ‘MySabah’ – a chatroom on social media – and that of DDJK (Jeffrey Kitingan) and YTL (Yong Teck Lee). As Foreign Minister, I travel a lot with the prime minister. I spend quite a lot of time with him when overseas. We have discussed Malaysian foreign policies in general, and specific issues at hand, and on how we navigate ourselves in the fast changing world. How we cannot afford to be static and on how a small country like Malaysia could be a global power. The prime minister, contrary to what some think, is in fact very well respected by foreign leaders, be it Kings, Emirs, Presidents and Prime Ministers amongst others. Secondly he is very sharp, and more importantly he listens. I feel very comfortable working with him. Sometimes I do raise domestic issues with him and he listens. 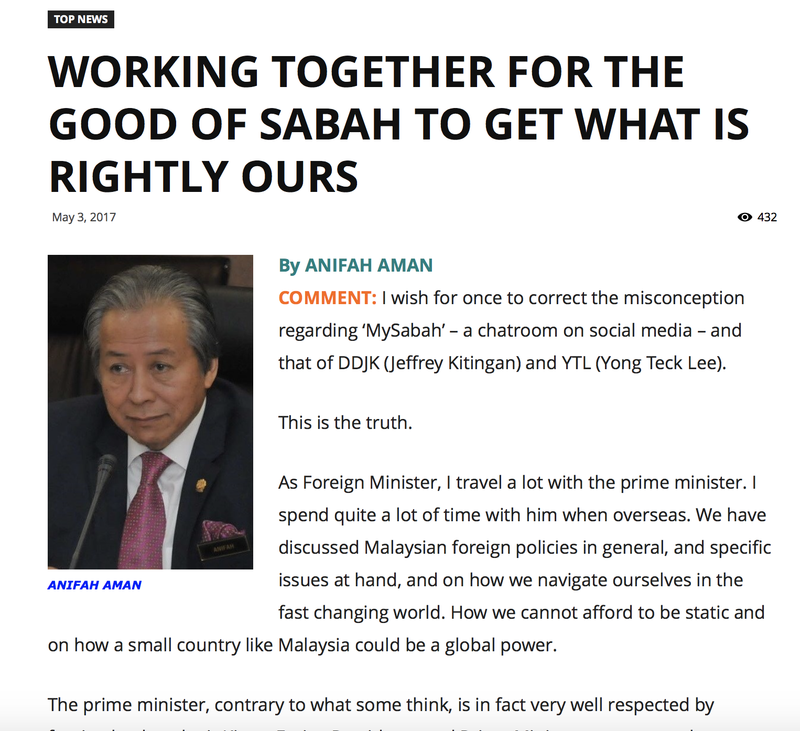 To cut the story short I asked myself, I have done so much for the country (by my reckoning), why not take this opportunity to raise issues of great importance to Sabahans? Are we getting a fair deal? Were the promises, assurances, agreements been implemented and fulfilled in the formation of Malaysia? Then I remembered DDJK, who for many years, at every opportunity, raised issues like the 20 points and the Malaysia Agreement (MA63) etc. No one in the seat of authority took him seriously. So I started thinking how to persuade some of us Sabahans to leave politics aside in this instance for a common good. I thought that my BN colleagues would not want to rock the boat, so to speak, and it was best I work with people who have issues to raise and “nothing to lose”. If anyone were to lose then it would be me. But I convinced myself that these opportunities of mine will never come knocking again. So I assembled a good number of people and this is where Ansari (Abdullah) whom I have known and worked with very closely over many years in football, and who’s a lawyer of some standing. Few people may know that I was the president of Sabah students (during our United Kingdom days) and YTL and AmDe (Sidek) were in my committee, and we fought for our rights even then. So I invited these people and specifically told them that I was not interested in their politics and they can leave their politics at home, but come and work with me as a Sabahan. I have access to the Prime Minister and here is a leader who is sympathetic with our grievances, so why not have a go. How do I do it? A forum consisting of great minds, including prominent constitutional lawyers and other prominent individuals was though to be the best option. It was attended by more than 7,000 people. DDJK, YTL, Ansari spoke eloquently thus with other learned invitees, and the need to follow through, and therefore the formation of MySabah for the like-minded minds! Where is politics in this??? I did invite some of the leaders in the current opposition but they never responded. I told DDJK to prepare a memorandum and to be submitted to the PM as a ‘united Sabahans’ devoid of any politicalor self-promotion. What wrong had these people done in trying to salvage what belongs to us! In the process a lot of committed Sabahans contributed their minds including DJL (James Ligunjang), TSGP, Roland C, TS Simon (Sipaun) and Dr Chong (Eng Leong) on RCI. There are many others that I am indebted to. QCs (Queen Councels) were consulted. We have gone far and all those aspiring ‘wanna-bes’ please make yourself useful for our future generations instead of wasting your time hitting at other people. To such people I ask what have you done for your State when your were in the position to do something. I am thankful to DDJK and all that have the conscience to come together as Sabahans to rightly claim what we are entitled to. Sabahans this is our best time and best opportunity to come together for s common cause. I can assure you that the PM will not send you to the Kamunting University (a district where previously Internal Security Act or ISA detainees were sent). God bless Malaysia. God bless Sabah. A strong and stable Malaysia is good for us all. Federations have a poor record of keeping states happily together for any length of time. The British union of England, Scotland and Wales is going through a stressful period and how much longer will Scotland remain in the family? Think of other federations that are now all but forgotten: The West Indian Federation, the East African Federation, the Federation of Rhodesia and Nyasaland, to name a few. In their modern form,federations were a British invention, used as a simple expedient for washing their hands off a difficult imperial political problem. We in the Malay Peninsula should take pride in nurturing Sabah into a modern state, a far cry from the days when I was sent out to the then British North Borneo to teach at Sabah College.We have prepared them well and we must set them free if this is what the people of Sabah really want. A referendum supervised by an international team should decide the matter once and for all. The same goes for Sarawak.Let them leave the nest. Freedom is their birthright.